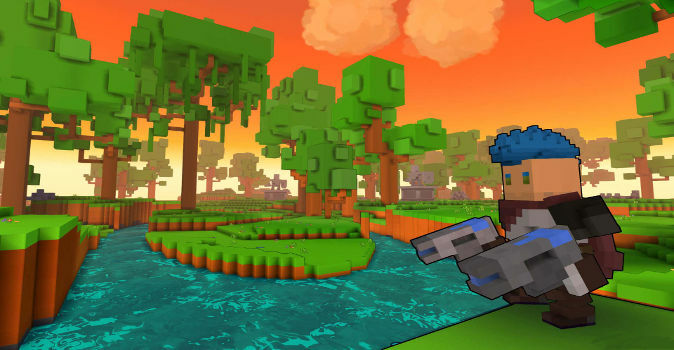 The guys at Trion Worlds truly had a moment of genius when they came up with the idea for ‘Trove.’ Before you get stuck into the colourful square universe of Trove, you’ll need to create a free-to-play account and download the minimal game client! You’ll be shown a fantastic intro about the world of Trove as soon as you login for the first time before you’re sent straight to the character creation screen. There are a total of 13 different classes to choose from, each with their own unique skills. These classes aren’t your standard MMORPG ones, but instead you’ll get to choose between the Pirate Captain, Neon Ninja, Gunslinger and Candy Barbarian. Once you’ve created your character, you’ll then be welcomed with open arms in the form of a tutorial. This tutorial will help you get your house in order and guides you through the first dungeons meaning that beginners to the genre will have someone there to hold their hand to stop them getting too overwhelmed by the sheer size of the game world, and the many dangers lurking within it. You’ll be spending a lot of your game time exploring the different empires and by different, we really mean different. The developers at Trion World definitely haven’t skimped on the sheer variety of worlds on offer, as you explore icy permafrost regions, enchanted forests and even a world made entirely out of cake. 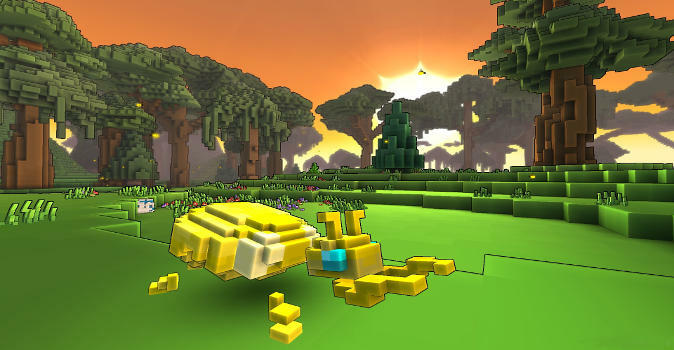 Trove literally has created everything and anything you can imagine but it doesn’t end there. You’ll also be able to explore massive flying islands, packed with sneaky traps and sought-after treasure. And if you’re wanting to explore the darkest depths of the underground, then prepare yourself for the sinister creatures that lurk in the shadows. The sheer diversity of the worlds really captivated us from the beginning and we think it might do the same to you. Once you’ve explored all that the developers have created in terms of regions and maps, there’s still a lot more for you to do! Trove provides a range of familiar content that you’ve probably seen in other MMORPGS, like dungeons and equipment upgrades but this content is continually updated so that you’ll find it hard to get bored! Of course you’ll also be able to grab hold of those computer blocks and try your hand at designing your own dungeon yourself. We haven’t quite managed to design a masterpiece yet but we have been concentrating more on discovering other peoples’ content. We should stress that the content that the Trove community has come up with so far has been extraordinary and we’re genuinely excited to see what else the players of the game can come up with in the future. As the world of Trove is particularly massive, there are some special means of transport you may find useful. First and foremost, your character is able to perform several powerful jumps in order to reach those difficult places. Special items increase the number of possible jumps you’re able to perform, so that later on in the game, you’ll easily be able to do 25 in a row! But when you’re just needing to get places quickly, you can build a type of monorail. It travels fast so don’t forget to hold on! In addition, you’ll also be able to ride on the back of fire-breathing dragons as you spread fear and destruction across the land. Failing that, you can always just peaceful fly around and take in the landscape. The choice is yours! Finally, if you’re needing to cross the ocean, then just take control of your own ship and sail the seven seas in search of buried treasure! What could be better than a giant world full of adventure and the possibility to become rich beyond your wildest dreams? You got it in one! Doing it all together with other players! Trove allows players to do this together in so-called clubs. These clubs can then band together to search for treasure or defeat particularly powerful bosses. You’re even able to create your own ‘club worlds,’ which is a special form of club-built empire, which acts as a meetup point for future adventures. This is when the MMORPG atmosphere really reaches its peak. 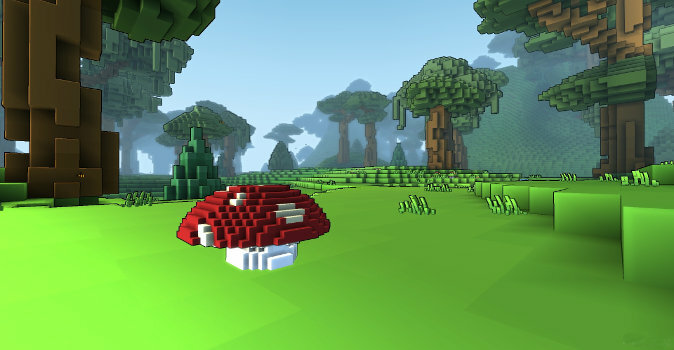 Great Block Graphics – The block graphics have been really well designed and transport you into a colourful and open world! Countless Worlds – Desert environments, neon-inspired city landscapes and frosty ice-worlds are just the beginning. There are so many diverse areas to discover! 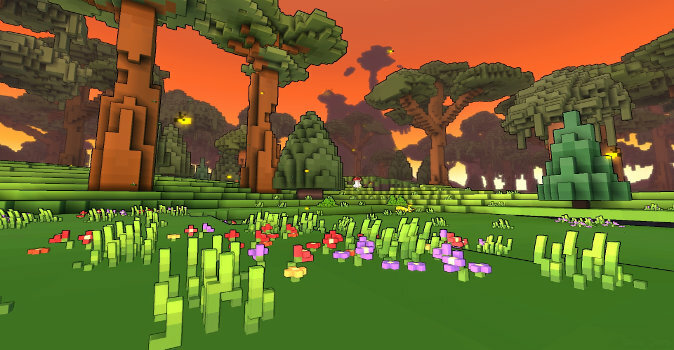 Player Content – The community of Trove allows anyone and everyone to be creative and create their own worlds so don’t expect to get bored easily! Your Own Clubs – Join together with other players and build your own club empire. You can even join together to search for treasure if you’ve had enough with building! We have already tested a number of games from Trion Worlds and they haven’t disappointed us yet. The giant world of Trove, packed full of enemies and secret dungeons, won’t leave anyone out in the cold! You’ll have to fight over and loot powerful items and the massive community provides players with the means to create their own dungeons and challenges. 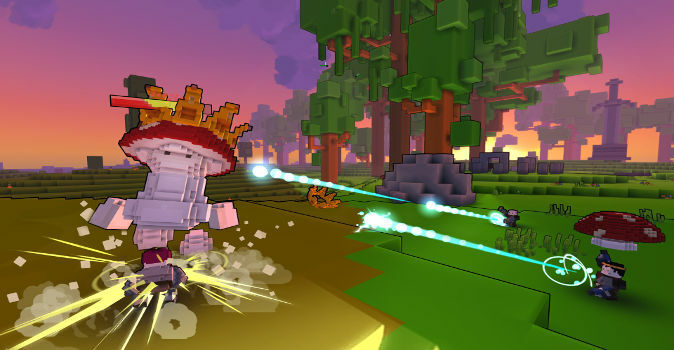 Trove can be summed up with just one word: dynamic. Battles are particularly action-packed and exciting thanks to special abilities, such as the jump mechanic! Unlike other MMORPGS, levelling your character isn’t everything and you’ll be able to jump into the ‘mining mode’ with just a click of your mouse. This mode allows you to mine resources and create blocks, which can then be used to design club houses or your own dungeons. There’s no time like the present! Create your free account today, download the client and dive into the colourful world of Trove!